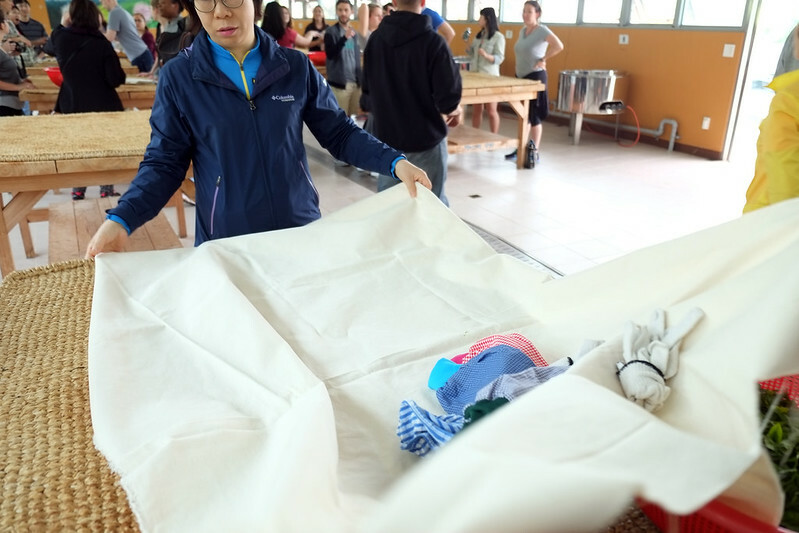 Join us this week for tea making at the Boseong Green Tea Festival. Welcome to week 277 (5/12/2016) of Travel Photo Thursday. This past weekend saw me taking another bus adventure 6 hours down the peninsula to Boseong's green tea plantation. I must be getting used to these bus rides. I survived this one with only a stiff knee. Now, when I say making tea, I mean literally taking the freshly picked tea leaves, and producing loose dried tea that will eventually produce a nice pot of perfectly brewed tea in my own wee kitchen. 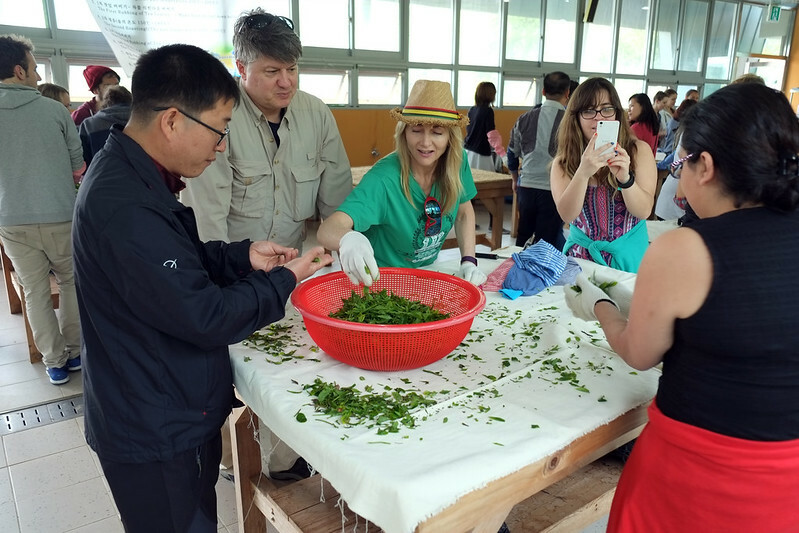 Join us this week for tea making at the Boseong Green Tea Festival. Welcome to week 277 (5/12/2016) of Travel Photo Thursday. This past weekend saw me taking another bus adventure 6 hours down the peninsula to Boseong’s green tea plantation. I must be getting used to these bus rides. I survived this one with only a stiff knee. Now, when I say making tea, I mean literally taking the freshly picked tea leaves, and producing loose dried tea that will eventually produce a nice pot of perfectly brewed tea in my own wee kitchen. 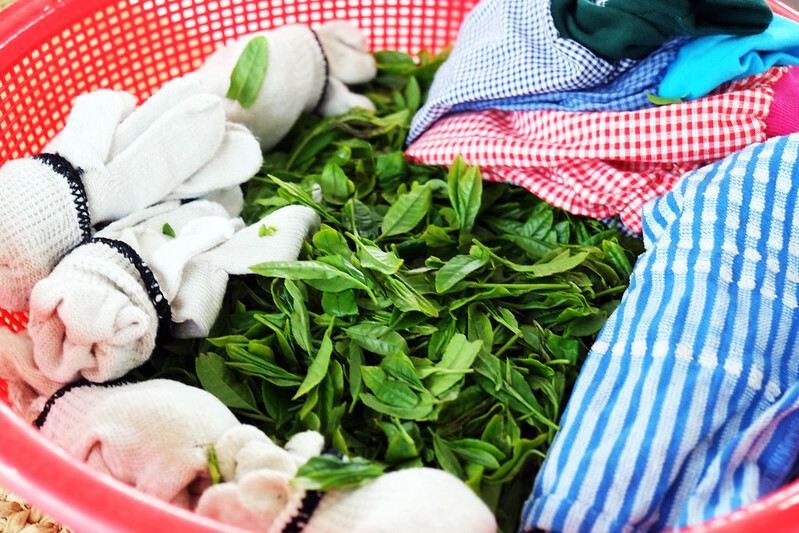 Our basket was filled with everything we needed to make our own batch of green tea. We have fresh leaves, gloves, and arm protectors (needed for when we tangled with the roaster). 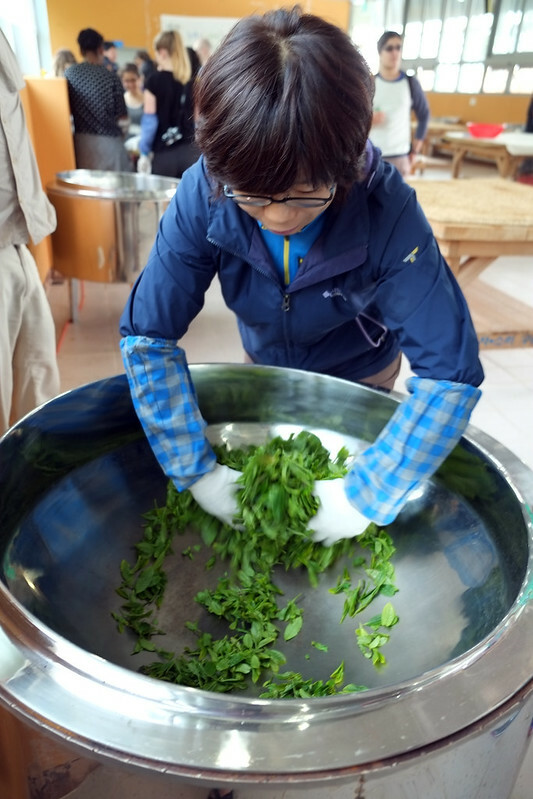 We had two expert tea leaf makers giving us a helping hand with our green tea making . Getting the table ready. The green leaf stands out nicely against the white cloth. Our first job is to check out the leaves and remove any that don’t look good. Now, we’re reading for the first roasting. The roaster is heated to between 200 and 250 C.
The leaves are moved constantly, so that they don’t burn. It’s back to the table. We grabbed a handful of the leaves and rolled them between our palm and the tabletop. Have to get rid of that moisture. The second and third roastings were between 150 and 180 C. Here we are after the third roasting. The leaves are totally dry. We’re ready to brew a pot from our own tea leaves. It was delicious, and to add to that deliciousness one of our group had a flask of whisky, and we all added a splash to the tea. That was just what the doctor ordered. We had a bit of a tense moment when one of our lovely tea experts looked at us and the whisky flash rather strangely. Turned out that he just wanted a splash of the whisky, too! Whew! Everyone was all smiles. The tea making took about an hour, and was fantastic. Everyone in our group really got into the entire process. After sipping on our creation (plus the whisky) we left with this nice little bag of tea to enjoy at home. I’m saving mine to enjoy with my Dad this summer. YES! I am leaving for Canada on July 21st. I’ll be in Vancouver, B. C. and Washington State for 10 days, and then it’s off to Nova Scotia to visit my pa for three weeks. I cannot wait to enjoy this delicious tea with him! The Boseong Tea Festival happens every May. 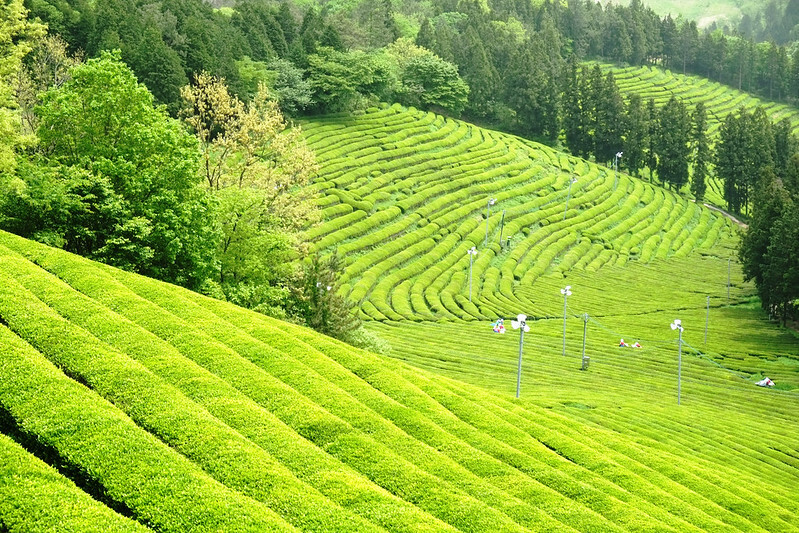 You can easily get to the tea plantation by bus or train from Seoul, and there are many all inclusive tours available. If you’re in Korea in May, I highly recommend this festival. It was one of the best that I have been to in a long while. I was there on the second day (Saturday), and the tea making was free (usually around $10US). Interesting! I’ve tried cooking lessons, chocolate-making and coffee-making, but not tea-making yet. Nancie, What a fun post and what a fun time. 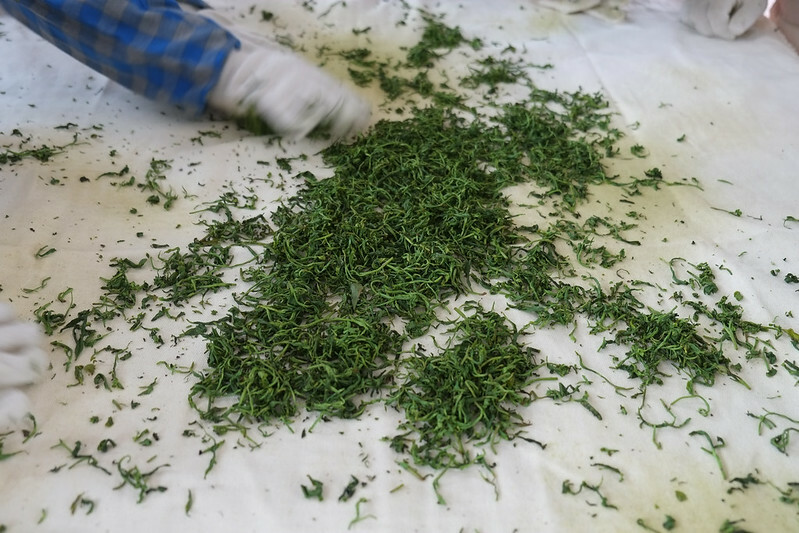 I had no idea that you could participate in roasting tea leaves and I’d never thought about a shot of whiskey in a cup of tea. . .great photos and a great story. This looks really fun! We have a tea plantation here in South Carolina but I don’t think you can make tea there. Would love to try this sometime! What a fun experience to make your own green tea. I’ve never thought about doing that before. An hour doesn’t sound like too long to do it, either. Best part – the sipping. 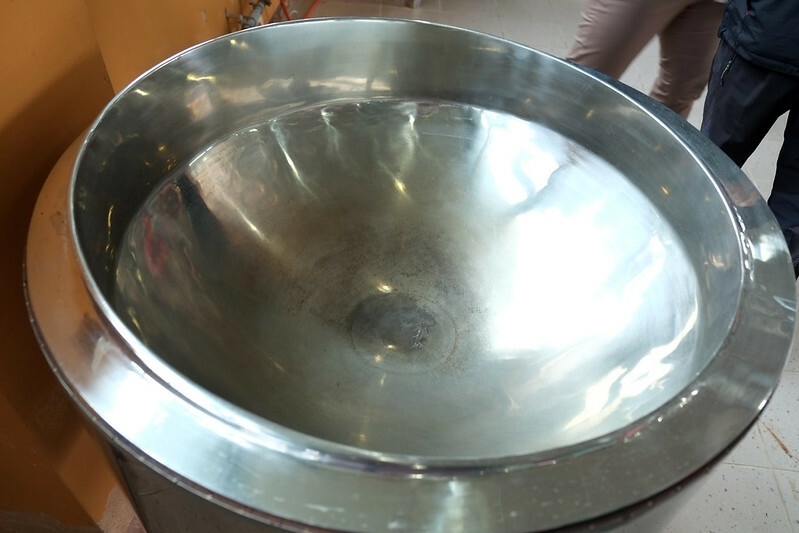 The tea making at Boseong’s green tea plantation sounds like so much fun. I’d like to do that. I haven’t liked the green tea I’ve tasted, but I’m pretty sure I would love it when I’d made it myself starting with fresh leaves. I would love to do this if I was there in May. You sure do get around Korea Nancie! 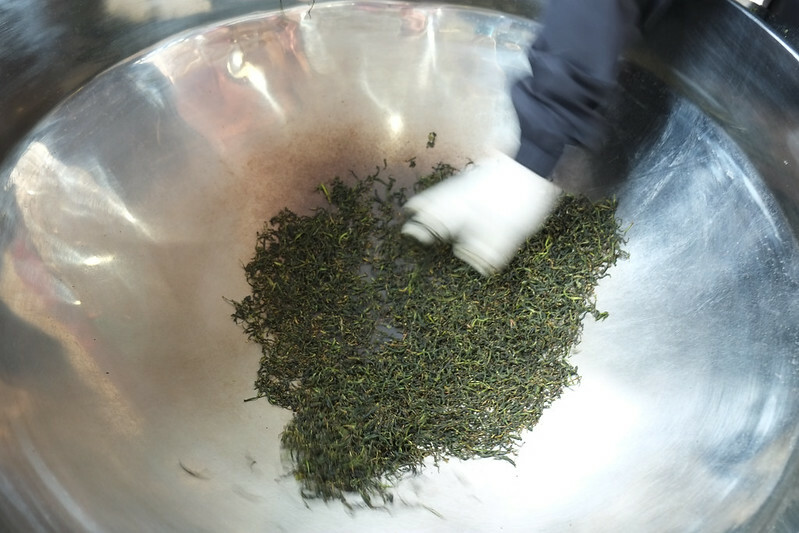 This is the first time I observe the tea “making” process. I would be excited of learning about this too. I am sure that tea was delicious (nothing to do with what we get from a package). Things taste better at the origin. Hi Sophie! This was my first time, and I highly recommend it! What an interesting and great experience. I’m not a fan of tea but I’d do this because it looks neat. The last picture is so scenic. Glad you’re going home this summer. What a wonderful thing to do. I’m not a big fan of green tea because I find it quite bitter, however maybe a splash of whiskey would make a big difference! What an exciting experience! I’d love to have the opportunity to make my own tea since I drink so much of it ;). Hi Brooke! 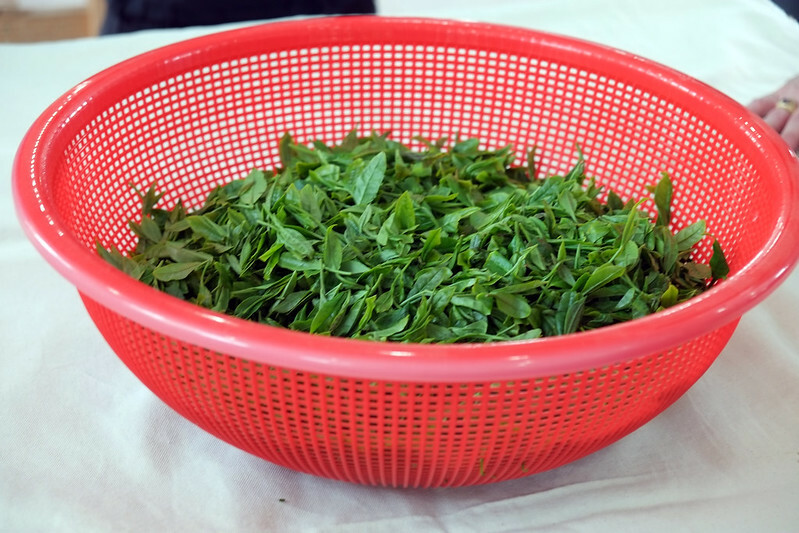 I am also a tea lover, so to get to actually participate in the process of drying the leaves and getting them ready to be used to produce a pot of tea was fun and interesting. I’d love to do this and taste a cup of fresh tea. 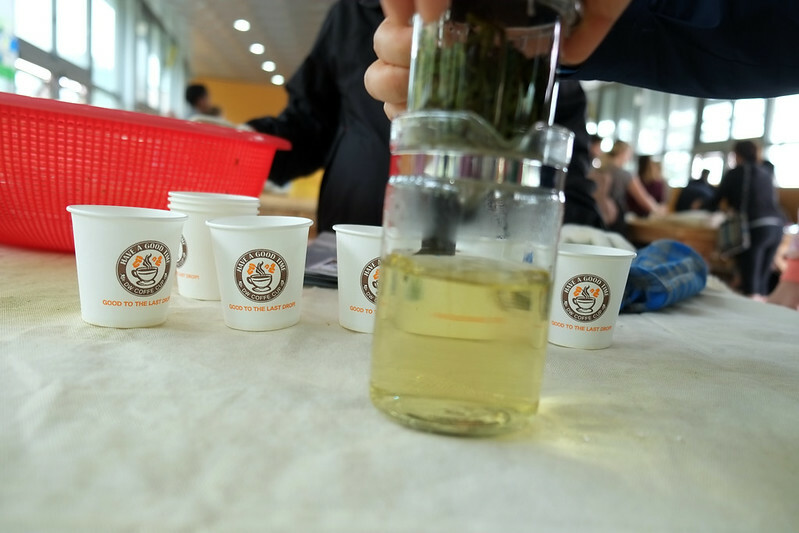 I always start my day with a couple of big cups of green tea and it was fun to see your photo of the tea plantation as well as learn about the process of how the tea leaves are prepared for steeping. Mmm. Thank you, Anita. 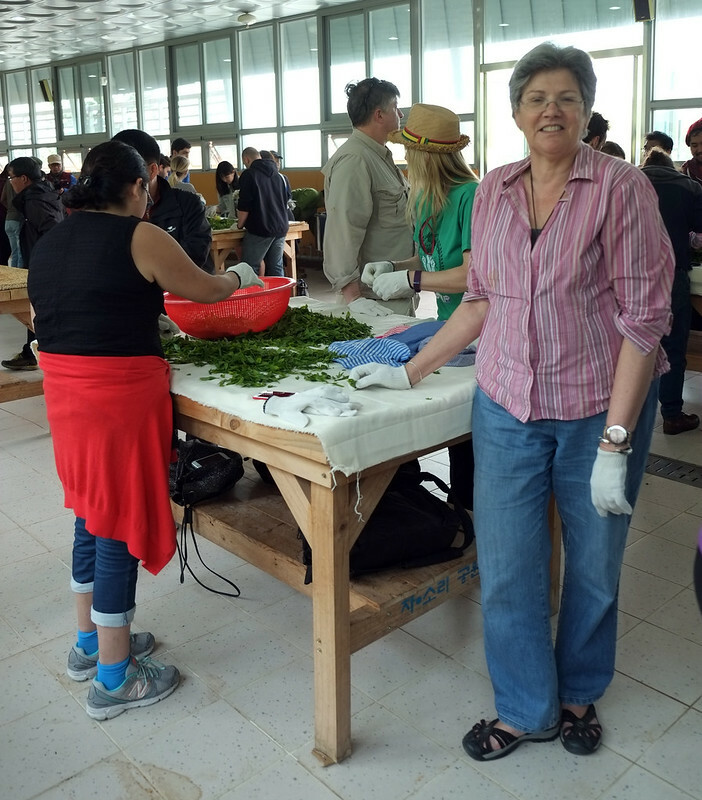 I always start my day with tea (often green), so it was great to be involved in the process, and sample our efforts once the leaves were ready. I have known of wine festivals but this is the first tea festival I am reading. How exciting! Tea is almost like a national drink for Indians. Great pictures you have!